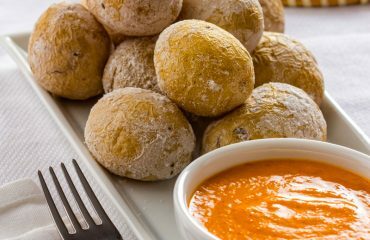 We’ve shown you before how to prepare the typical Canarian ‘Mojo Rojo’, the red spicy sauce from the Canary Islands, that’s usually served with small and salty boiled potatoes, the ‘Papas Arrugás’. This time we want to introduce you to the world of the Canarian Gofio, a flour of mixed grains that’s a primary ingredient in a big variety of traditional dishes in the Canary Islands. ¿What is the Canarian Gofio? The Gofio is a flour made of different toasted grains, like corn and wheat, mashed in a traditional stone mill to a more or less fine flour, usually mixed with a bit of salt. You can find Gofios made of corn, suited for gluten-free diets, and others made of only wheat or even mixed. There are still restaurants in Tenerife that produce their own Gofio in local stone mills and use it to prepare a big variety of sweet and salty dishes, there’s even ice cream with Gofio taste! The Gofio flour has a long history in The Canary Islands since it was the main food of the Guanches, the original inhabitants of Tenerife. Back then it played an essential part in their diets in times of food scarcity. 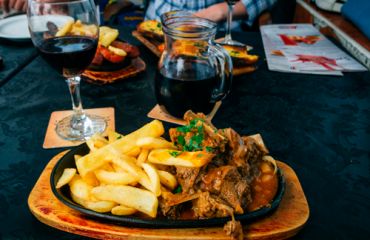 Since then, Gofio has continued to be a fundamental ingredient in the Canarian diet. It is used as a substitute of normal wheat flour, since its more tasty thanks to its toasted flavour or as a complement for all kind of creations to make them more nutritive. Its high percentage of minerals, carbohydrates and proteins make it a super-food. 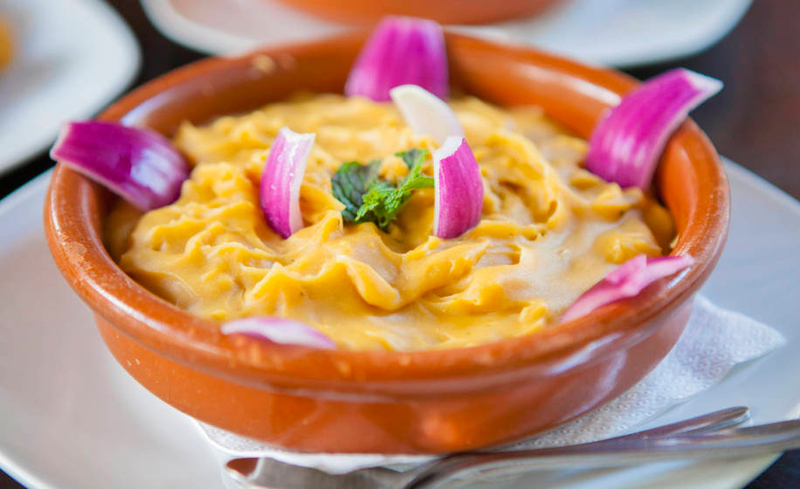 This dish consists of a fine Gofio puré served with various toppings and chopped onions on the sides to use them as a spoon. On top you can complement it with some peppermint leaves and sometimes even with red or green Mojo to make it extra tasty. 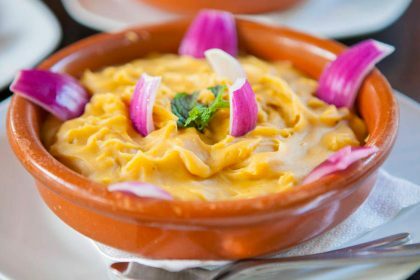 Every Island has its own recipes, in the eastern Islands usually the Gofio Escaldado is made with fish broth and in Tenerife and the other western islands it’s typically made with meat broth. Here’s a very simple version of the Gofio Escaldado, be creative and add your own ingredients! 1 Liter of strained homemade fish or meat broth (as preferred). Grind the garlic to make it extra small with some salt and olive oil and leave the mix aside. Prepare the Gofio in a bowl and slowly add the hot broth, stirring it until it gets a smooth texture without any lumps. Next, add the mix of garlic and the finely chopped onion. You can add some prepared meat or fish pieces if you like or whatever you have home, some people even like to add boiled potatoes. To finish, add the peppermint leaves on top and the big slices of onion on the sides to dip them into the Gofio. Rest for five minutes and enjoy! You can add some mojo sauce on top as well for that extra spicy taste.